MICRO EUROPE Ltd. was established by technical research and development engineers – private persons – in 2001 to create a high level research center for innovation projects, to develop and introduce new technologies and to create adequate circumstances for the production of new products. Thanks to the academic degree of our experts and their research and development activities both in the university and private sector, they are very creative and problem-solving in answering questions arising in the field of engineering. Our engineers are expertised in the development of new, individual processes and technologies which results in the design and implementation of energy-saving, enviroment friendly processes for the future. In the beginning MICRO EUROPE Ltd. developed projects where the working surfaces (polygon profiles) were formed using the Gellért lathe patent. As a result of this activity some new products were manufactured. Furthermore MICRO EUROPE Ltd. is – in accordance with its phylosophy – active in enviroment friendly projects and the utilazition of alternative energy. Thus the company worked out a „hydraulic blasting process” to recycle waste rubber into elastic microporous particles and this compaund can be re-used as raw material in various mixtures. As regards the utilization of alternative energies, the development of a micro power station under water level are one of the new research targets. 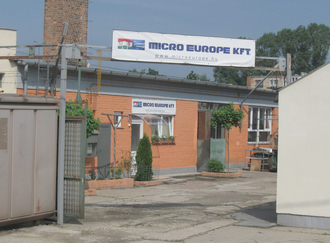 Both the offices and the workshop of MICRO EUROPE Ltd. are located in Miskolc, where processing facilities and a high pressure water jet lab are available.